Is this the best Dunlop safety wellington on the market? Well, it is certainly one of the most popular brands in the world. A tough and hard wearing wellington used in a variety of farming applications. Purofort material technology keeps you insulated down to -20°C,for great thermal protection. The cushioned footbed offers comfort for all day wear. A traction insert improves grip on a wide variety of surfaces. Contoured upper for a great leg fit. Wide toe area doesn't give cramped feeling allowing your feet to breath. Easy clean tread for practical farm use. Fantastic wellington in town or country. 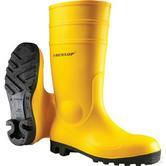 Dunlop Purofort C762933 Safety Wellington conforms to: EN ISO 20345:2011 S5 CI SRC safety standards. The Acifort Heavy Duty Full Safety Wellington is a practical and durable industrial boot from Dunlop. 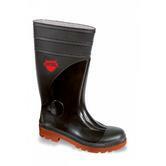 This Safety Wellington is resistant to acids such as cement and concrete. It comes with the optimal grip out-sole, steel toecap and mid-sole. 100% waterproof and resistant to many common chemicals. Includes a steel-tipped toe and steel midsole for impact and penetration protection. Complies to EN ISO 20345:2011.S5.SRA safety standards. Vital Groundworker Black Safety Wellington is a general-purpose safety toecap and puncture resistant midsole wellington. Exceptionally comfortable Wellingtons with extra room toecap area. Reinforced ankle and shin areas, lower the chances of any injuries. Anti-clog sole with shock absorbing heel, reduces fatigue throughout day. Designed to optimise the users comfort and safety. V12 Sitemaster S5 Safety Wellington conforms to: EN ISO 20345:2011 S5 safety footwear standards. Very practical safety wellington with a steel toe cap and midsole. Steel toe cap protects against impacts. Steel midsole protects against cuts & Punctures. With cutting guides for perfect height adjustment. Energy absorbent, oil resistant and non-slip rubber sole. Resistance: minerals, animal and vegetable oils & fats, disinfectants and various chemicals. 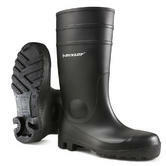 Himalayan 8810 Black PVC Safety Wellington with Steel Midsole. Water penetration and water absorption resistance. Energy absorption of seat region and penetration resistance outsole. Himalayan 8810 Safety Wellington complies with European protective footwear standards EN 20345:2011 and S5 rating. Safety protection tested to 200 Joules impact toecap protection. Ergonomically designed and flexible, made using Quality PVC. Up to 80C heat resistant outsole. PVC/Nitrile Sole and SRA - Slip Resistance Outsole provides protection and balance, stability and more durability. The Acifort Wellingtons from Dunlop with steel Toe Caps & Midsole. An ideal waterproof alternative to the standard leather Rigger boot. The Acifort is lightweight and 100% waterproof and insulated down to -20°C. It is easy to clean, durable and flexible, perfect for rig and construction environments. 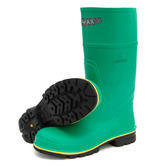 The Devon is a quality PVC/nitrile mix wellington from Dunlop with a steel toe-cap and mid-sole. It is made with oil and slip resistant, anti-static out-sole. 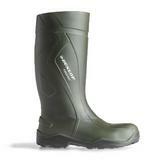 The Dunlop Devon safety wellington is made for both, men and women. This safety wellington complies to EN ISO 20345:2011.S5.SRA safety standards. Includes shock absorbing heel and antistatic properties. The Protomastor 142PP is a sturdy wellington from Dunlop. It comes with tough PVC/Nitrile upper. Energy absorbing heel which protects the joints on impact on unstable ground. These wellingtons conform to EN ISO 20345:2011.S5.SRA safety standards. Includes toe protection up to 200 joules impact and penetration resistance. Virgin PVC Upper Polyvinyl Chloride is a water resistant polymer, simple to wipe clean. Reinforced heel, ankle and sheen region for extra duration and impact absorption. 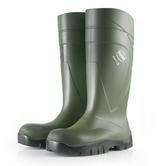 Amblers FS99 Unisex Safety Wellington conforms to: EN ISO 20345 S5 SRA. Textile lining, Virgin PVC Upper Polyvinyl Chloride is a water resistant polymer, simple to wipe and keep it clean. Energy absorbing heel, Reinforced heel, ankle and sheen region for extra duration and impact absorption. Antistatic safety boot with a Steel toe cap protection tested to 200 joules impact and Steel midsole penetration resistant to 1,100 Newton. Dunlop C762043 S5 SRC Purofort+ Safety Boots offer all the benefits of Purofort and a superior outsole. It makes an ideal boot for every-day work. Fully waterproof with no stitched seams, keeping your feet warm and dry all day. Steel toecap and midsole, gives you full safety. The boot is easy to keep clean. Pull on tabs make it easy to slip on. Complies with EN ISO 20345:2011 S5 CI SRC safety standards. The SB classification for safety footwear with anti-static protection. Dunlop Acifort wellingtons features include a protective toecap, Steel midsole and a slip resistance certified - SRA. The boots are tested and certified in accordance with the Safety Footwear EN ISO 20345:2011 standard. These boots have a maximum resistance to mineral oils and to hydrocarbons. It contains a removable anti-bacterial footbed that absorbs and releases moisture. They are light, flexible and provide good ankle protection. Ideal for both construction and agriculture industries. The Polyurethane outer material is resistant to chemicals and fuels, making this wellington ideal for refineries, chemical plants and farming. Poly-Bed removable insole, antistatic, it absorbs and releases moisture. The upper layer is made of antibacterial textile Sany-Dry to prevent from bad odours. Mono Density PU outsole: exceptional abrasion resistance and ideal for environments where oils and solvents are used. Cofra Tanker S5 Safety Wellington conforms to: EN ISO 20345:2011 S5 CI SRC. 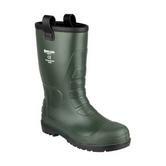 The Dunlop Purofort Comfort Grip safety wellington is a specific work boot for the professional fishing sector. Specially equipped to deal with adverse weather and work conditions. It has a special, flat, anti-slip outsole profile that offers superb slip resistance to allow you to work safely on wet, slippery and dirty floors. The smooth leg shaft is dirt-repellent and easy to clean. The excellent cold insulation provides a lot of wearing comfort. Includes a protective steel toe cap and steel midsole for impact and penetration protection. Complies to EN ISO 20347:2012 O4 FO CI SRA safety standards. A chemically protective anti-static boot with an integral steel toe cap and vulcanized rubber sole for superior slip resistance. Green Hazmax chemically resistant compound shaft certified to EN 13832-3. Conforms to EN 943-1 (Chemical protective) and 200 Joule Epoxy coated Steel toe cap. Features an extra high and wide fit steel toe cap that combines protection with comfort and Steel puncture resistant midsole plate. Made with a Seamless construction and extra shin protection. Moisture absorbing insole (removable and machine washable) with knitted nylon lining. SRC approved boots, also ideal for food processing or industry. 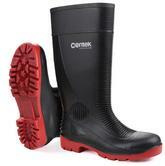 Bekina StepliteX X040/9180 Polyurethane S5 Safety Wellingtons conforms to: ISO 20345, S5, SRC. The Sitemaster Wellington provides steel toe cap and midsole protection. Its made of PVC Nitrile that provides all round protection for the most demanding workplaces. It has extra room comfort zone cap, heavy duty upper and heel reflector. Cut down bands, reinforced ankle and shin areas. Kick off spur, shock absorbing heel and non clogging sole. Waterproof, SRC rated Anti Slip and Anti Static Safety Wellington. Ideal for Construction, Tradesman, Farming, Agriculture, General Industry, DIY. Our Mens Construction Safety Wellingtons range has safety wellingtons from Amblers, Dunlop (including Acifort, Protomaster, Purofort) and Vital. These safety wellies are used widely on construction sites, railways, motorways and the general building industry. There a selection of wellingtons made of PVC (durable) and PU (greater comfort and flexibility) and even brown Rigger wellingtons; All have protective toe caps (Steel toe cap or Composite toe cap). The Amblers FS95 Construction Safety Wellingtons are warm lined with a protective midsole to prevent punctures or tears. The S5 wellington midsoles have been steel or kevlar reinforced to prevent nails,needles,knives penetrating underfoot; this also makes the wellingtons more comfortable on uneven ground. 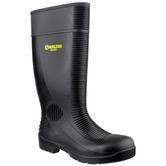 We supply the best of the best safety wellingtons, such as Dunlop wellies .